Instructions: Click here to view a larger photo of this project. Cut out the SVG file of the box with an electronic machine using white cardstock, decorate it with papers from the collection and put a ribbon over the lid. Take the big stamp from the Cheery Pansy set and Jet Black ink, stamp the pansy on white cardstock. Die cut and color the center with Buttercup, then use the French Ultramarine and the Teal Zeal on the rest of the flower. Take the blender and blend all the colors together. Shape the flower on the Deluxe Shaping mat, glue some prills in the center and make some lines in the center using black fine liner. Now cover the flower with the 3D lacquer and allow to dry. Once dry, glue it on the top of the box using hot glue. Using Jet Black StazOn ink, stamp the pansies on Shrinky Dinks paper. Color the 3 pansies with some yellow and blue colored pencils, cut them out with a good scissors. Make a hole in one of the flowers with a hole punch, I used Crop-A-Dile. Then shrink the 3 flowers with your heat gun or in the oven (follow the instructions on the package). Embellish with 3D lacquer and allow to dry. On the flower with a hole, insert a small charm ring, so you can attach it to a necklace. 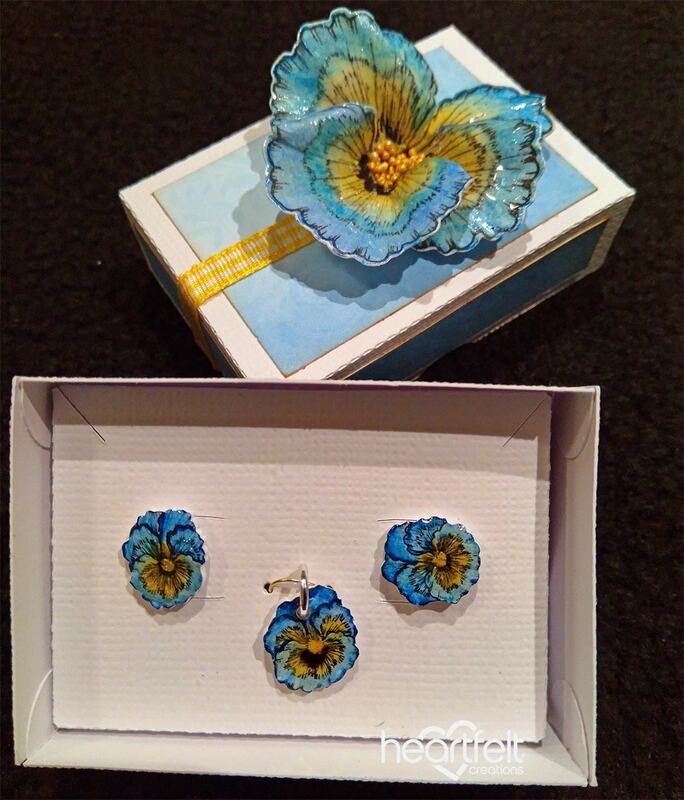 Use the remaining flowers for earrings, by hot gluing the earring studs on the back. Place them in the Jewelry Box, you just made.